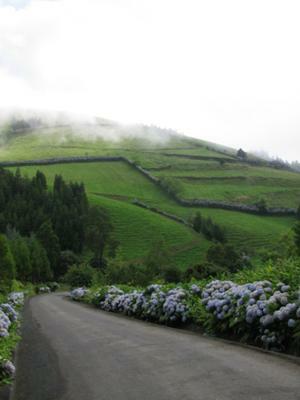 We took a trip into Ribeira Cha and decided to drive further up into Cha de Macela to see the hydrangeas. They were huge and they were everywhere!! It looks like the fog was rolling in too! Great picture. Please feel free to post some more pictures and stories. I love it and know that site visitors do too! 2008 was the first time we actually drove up as far as we could at Cha de Macela. We travel to the Azores at least once a year and we found the scenery really spectacular. Plan a visit to Cha de Macela next time you travel to Sao Miguel, Azores but make sure you have plenty of time to stop and enjoy the views. Great picture! Makes me want to go back. Join in and write your own page! It's easy to do. How? Simply click here to return to Your Azores Pictures.